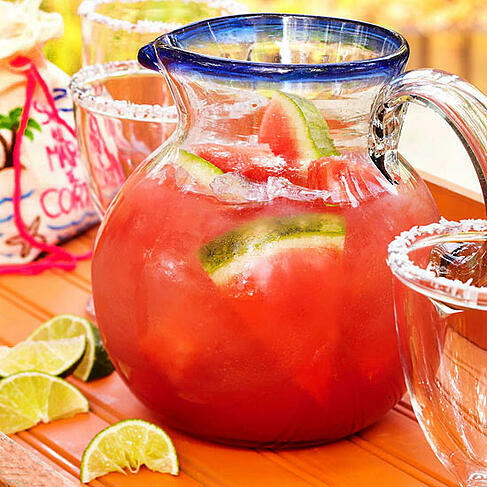 The Best Grilling Drinks For Summertime Fun! With the weather getting hotter and the kids getting out of school for the summer, it is safe to say that grilling season has officially begun. Grilling out is one of the most popular activities for Americans to do during summertime! Food and drinks have always had the power to bring people together. With the warm summertime temperatures upon us, we always need to make sure that tasty, cold cocktails are on-hand to keep everyone refreshed. From cocktails that pair well with specific types of food, to drinks that are perfect for serving large groups, there are many possibilities. Below are some of my all-time favorites that are not only easy—but delicious. The number one drink that many adults think of when it comes to grilling is beer! Whenever you have a BBQ there is usually a good supply of beer. Believe it or not, there are beer cocktails that are delicious, crowd favorites. Blend the watermelon until liquified. Strain out the pulp, saving only the juice (makes about six cups of juice). Stir in sugar for two minutes or until dissolved. Refrigerate. Gently stir in the the maraschino liqueur and beer. Stir Applejack, lemon juice, syrup and vinegar in a large pitcher. Add 1 cup ice. Cover and refrigerate for 2 hours. Gently stir in beer and club soda. Pour over ice into highball glasses, and garnish with lemon wedges and your favorite Royer swizzle stick! Fill 1/2 a collins glass with a stout and gently top with champagne. Another summer drink that is popular is tea. There are so many types and flavors of tea that the options for tea are endless. Here are some tea cocktail ideas to spark your creativity. In a medium saucepan, bring the 4 cups water to a boil. Add the tea bags, remove from the heat, cover, and steep for 15 minutes. Meanwhile, put the sugar and limeade concentrate in a 2-quart heatproof container (like a large Pyrex liquid measure). When the tea is ready, remove the tea bags (don’t squeeze them) and add the tea to the limeade mixture, stirring to combine. Stir in the 3 cups cold water, let cool to room temperature, and then refrigerate until ready to serve. To serve, pour 1-1/2 ounces of the whiskey into each 12-ounce glass. Add 1 cup of the limeade-tea mixture to each glass. Stir to combine. Add ice and garnish with the lime wedges, if you like. Combine the blackberries, sugar and chopped mint in a large bowl and mash with a potato masher or wooden spoon; let sit while making the tea. While the blackberries are macerating, bring 1 1/2 quarts cold water to a boil in a medium saucepan. Remove from the heat, add the tea bags and let steep for about 3 minutes. Remove the tea bags and pour the tea over the blackberry mixture. Let the mixture sit at room temperature for at least 1 hour to let the flavors meld. 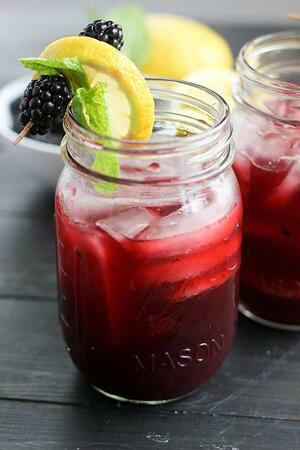 Serve the blackberry tea over ice in tall glasses and float a shot of bourbon on top of each. Garnish with fresh mint sprigs (like a mint julep). Add the tea, mango juice, gin and simple syrup to a pitcher. Stir and refrigerate until chilled. Serve in glasses filled with ice and garnished with fresh mango slices and mint. Don't forget to compliment your drink with one of our festive swizzle sticks. They are the perfect partner to any drink that you decide to make this summer! Event-Themed Swizzle Sticks Are a Big Hit at Tiki Caliente!